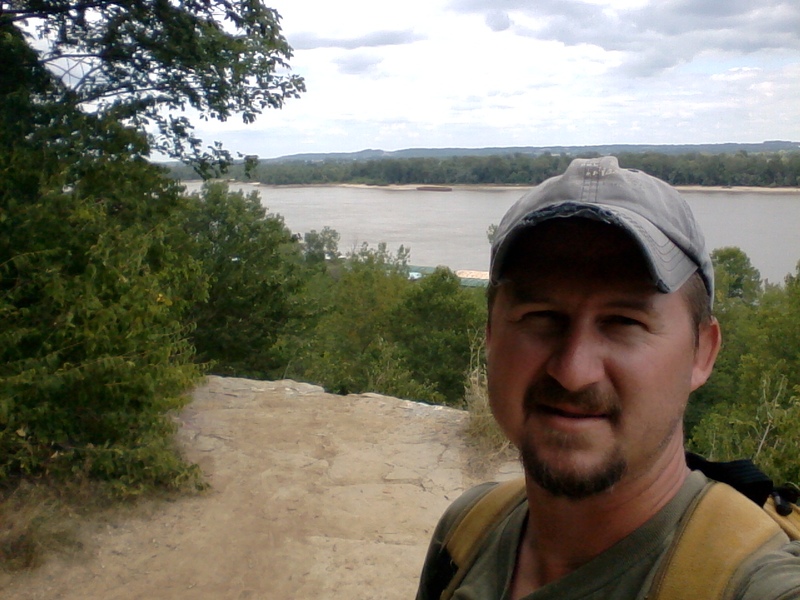 It had already been a weekend full of outdoor experiences, having camped at Meramec State Park for the Meramec Watershed Celebration picnic put on by the Open Space Council for the St. Louis Region. We had been planning on staying an extra night and coming back Monday, but plans were altered and we found ourselves with a Monday morning trip to our awesome St. Louis Zoo (hadn’t been there in a while). As if THAT wasn’t enough walking around, that afternoon I felt Max had been cheated (dogs aren’t allowed at the Zoo) from an outdoor excursion, so I put him in the car and we headed down the road to a park I am very familiar with, but a trail I had not known about until just recently (Thanks, Tom!). We were on our way to Cliff Cave Park to check out the River Bluff Trail. 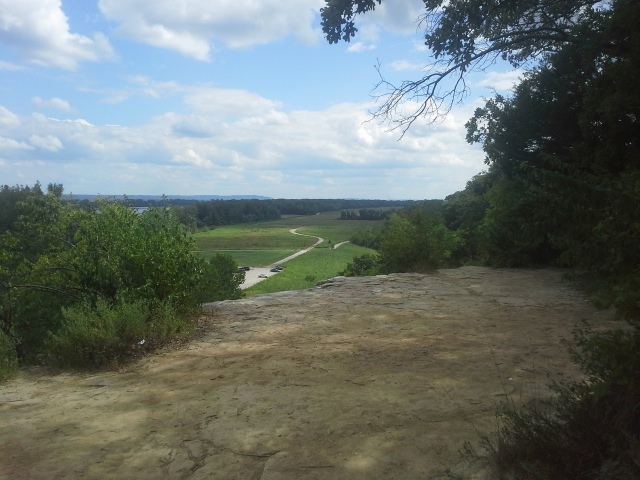 Cliff Cave Park is in the South St. Louis County area, off of Telegraph Road. From the 55/270(255) interchange, take 255 south toward the Mississippi River to Telegraph Road. Make a right (south) onto Telegraph, and take that about 2 miles to Cliff Cave Road. Make a left onto Cliff Cave Road. After about a mile and a half of winding your way through the neighborhood, you will come to the park entrance, go down the long hill, and around the curve to the left. The parking lot for the River Bluff Trail and Spring Valley Trail will be in front of you on your right. So that long hill you drove down? 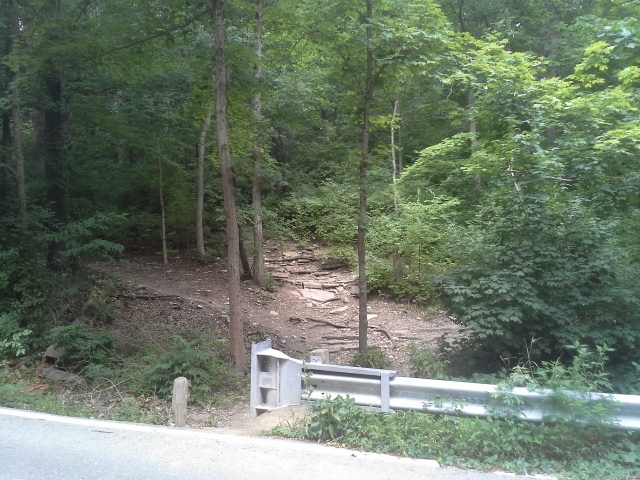 The trailhead for the River Bluff Trail is halfway up on your right, where the guard rail ends. Carefully, keeping dogs and children close, walk up the hill making sure to be in full view of oncoming traffic, and make a right into the woods when you see the trailhead. After getting off the road, I turned left and went through what seemed like a series of wide curving switchbacks up the gentle slope to the top of the hill, eventually coming around back toward what seemed like it might be the trailhead, and then out left in the direction of the river. 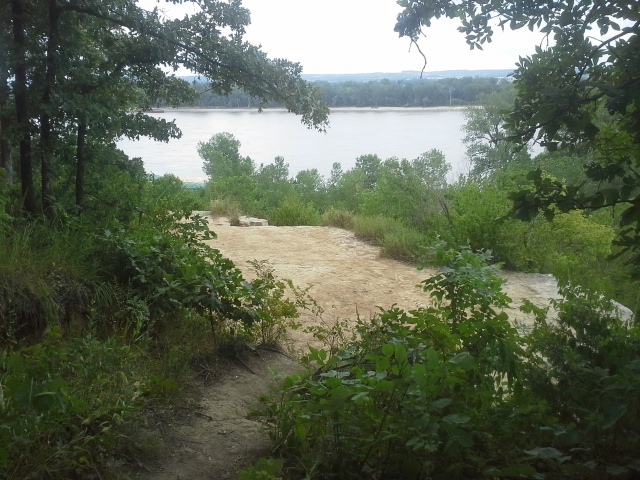 Once at the bluffs over the train tracks and the river, it curves wide to the right and descends just slightly before getting back to the trail head at the road. Carefully back down the road to the parking lot, and you are all done. It is a quick have-to-get-into-the-woods trail. It is relatively nearby my house. It is just over a mile long. When I am pressed for time but I am feeling that need to spend some time in the forest, this would be a great destination. 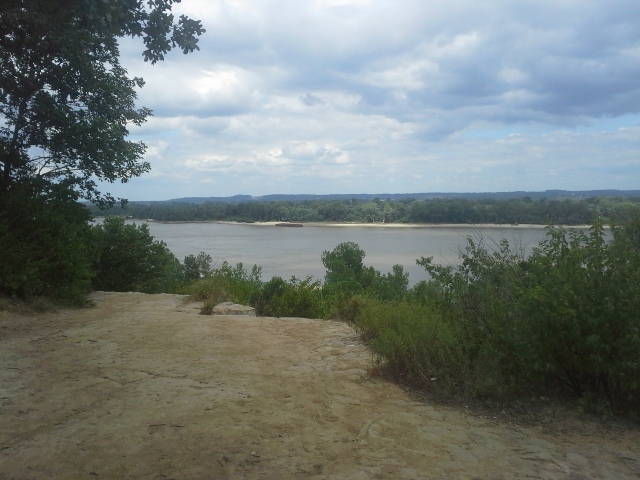 It gives you an impressive overlook of the Mississippi River. Something that is not so easy to find in the St. Louis area that isn’t in somebody’s backyard. I ended up picking up a grocery bag and a half of cups, cans, and bottles while hiking this trail. Seems like it gets a lot of traffic, but please carry your trash out. 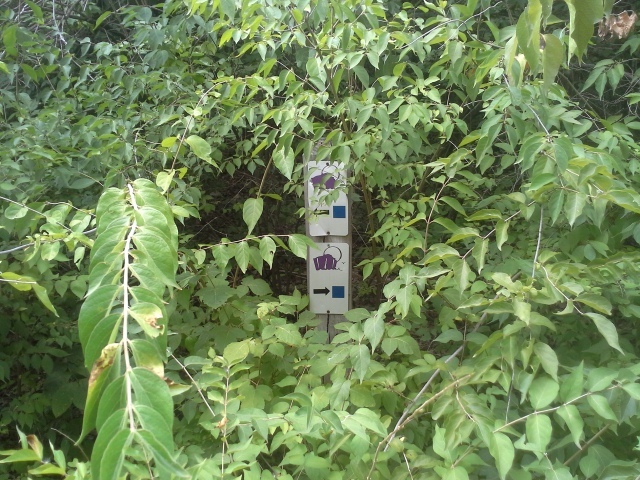 The trail markers were sparse, so take a look at a map beforehand so that you have an idea of the path you should take. Sure, you’re between a river and a residential area, but one wrong turn and you might find yourself down in a quarry next to a barge. It was cool little walk through the woods out to the bluff, with a great view, and what I think I like most about it was that after having hiked the other trails in this park for probably ten years, I had no idea that this trail was here. One of my favorite things is to find new places to spend time in the woods, especially when they are so close.